That's the way to go. If you did use threaded standoff holes, then you'd have to deal with quality control issues when the anodized finish intrudes on the threads. I've had to deal with that on the consumer side. these cases are just about bomb proof. i bet you could almost hold up a car, with one under each tire. Haha... not so sure I'd want to try that. Thought you might like these renderings (kinda DeLorean-ish). 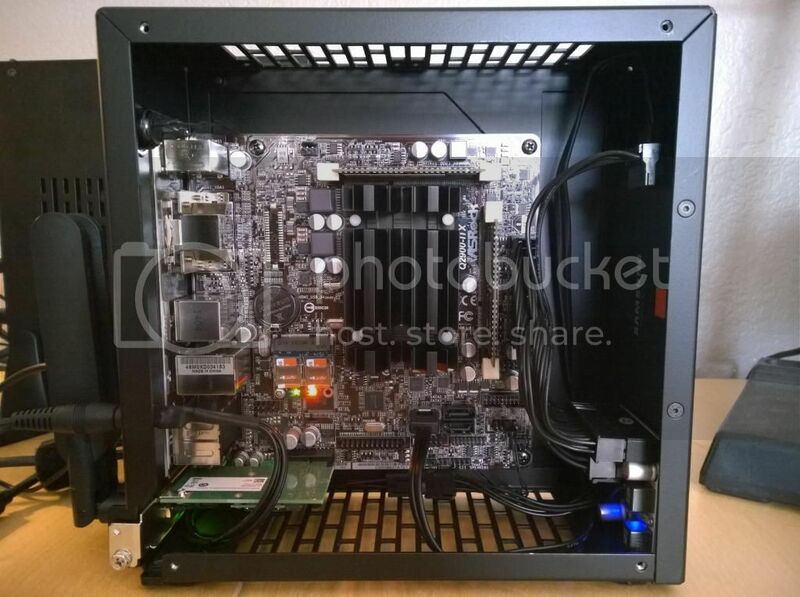 im think of this for my next build in that case...well ok, not so much IN the case. Decided to go with Centrino card over mini pcie version as the card has antenna connectors built into the pci bracket, lack of IO connectors for Wifi about the only shortcoming on the mobo. Wish they'd just get rid of VGA connectors already and go only DVI. Loaded Win10 preview boot onto one 64GB SD micro and was going to install it on the other for a dual boot but Win10 install didn't offer the option so likely will get one more cheap SSD to try that on, still have a power connector left and 1 Sata-III. Contrary to Bplus the MR15 can be booted from, think it's more a matter of your BIOS/UEFI etc.